AFRICA - a continent of beautiful teeth yet few commercially manufactured toothbrushes! How can that be? For many, the secret behind a bright smile lies in a simple piece of wood the chewing stick! Chewing sticks were once used by the Babylonians and later by the Egyptians, Greeks, and Romans. These small wood "toothbrushes" were also common in pre lslamic Arabia1. 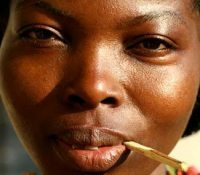 The chewing stick fell out of favour with Europeans about 300 years ago, yet it is still popular in parts of Africa, Asia, and the Middle East. The most common source of the chewing stick in the Middle East is the saltbush, otherwise known as the toothbrush tree. In West Africa, lime and orange trees are used, while neems2 are a main source for chewing sticks in the Indian subcontinent. In East Africa nearly 300 different species of trees and shrubs are used to make chewing sticks. How does the stick clean teeth? When the stick is chewed, the fibres at the end become loose, forming a rough "brush." Continued chewing dislodges3 particles between the teeth and stimulates blood circulation in the gums4. Chewing also increases saliva production, which acts as a natural mouthwash that rinses away bacteria and creates an inhospitable environment for them to flourish. * But the chewing stick is more than a mere brush. Twigs and roots of some plant species contain chemical compounds that slow the formation of plaque5. Extracts of some sticks have been shown to have antibacterial properties. The twigs of the toothbrush tree, mentioned earlier, can even help prevent ulcers6. In Namibia, sticks taken from a plant known as muthala inhibit the growth of pathogens that cause decay7, gum disease, and sore throats. This natural dental device can prevent cavities as well as strengthen roots and gums. Some companies now make toothpaste that contains fibres and resins extracted from such plants. Some, of course, prefer to use a traditional toothbrush. Whether you choose to do so or to use a stick, as the ancients did, one thing is certain: Dental hygiene is an important part of personal health care. * Of course, diet is also important. Rural populations in Africa often eat more whole grains and vegetables than their urban counterparts. They also generally consume less sugar, refined foods, and soft drinks-known culprits8 in tooth decay.